Above are a few designs you can easily do with your air tool. On this page is an array of designs for your project. 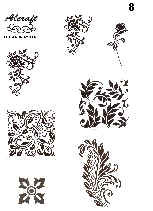 These are adhesive backed stencils. To use, merely cut out the desired design, remove the back carrier paper, apply the self-sticking design to your egg, and cut through the stencil and egg shell with your air tool. After you have cut out the design, remove the remaining part of the stencil and you’re finished! $3.00 each All sheets are 8½" x 11"
(DISCONTINUED) Blank Stencil Sheets 8½" x 11"
needed is a copy machine or printer.